Posted by jackedavis in undergraduates, what can you do with a history major? Ever feel like you’re up a tree? Danny Lyons (1994) is up one quite often. Ever get a hankering to scale one? He’ll take you. Lyons is on the cover of the spring 2014 issue of the Gainesville magazine Our Town, hanging from a live oak giving a big thumbs up. A broad smile says he’s found his niche in the upper reaches of this sylvan native. Then, sometime after graduation, he stopped looking back so much as up. 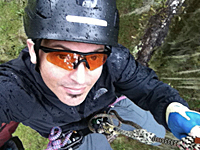 It wasn’t long before he started Canopy Climbers, an eco-adventure outfit he runs centered around teaching people how to tree climb. You should also know that if you ever need a cat rescued from a tree, he’s the guy to call, not fire rescue or animal services. Both agencies will refer you to our tree-climbing alumnus.